Announcing The Perfect Little Planner a diary style wedding planner that does what great wedding planners should do - encourage, remind, and inspire while saving you money. New York, NY, February 12, 2018 --(PR.com)-- The Perfect Little Planner, a journal sized wedding planner is taking the pressure off of brides everywhere. The Perfect Little Planner empowers the bride to become her own best planner. “The best person to plan a wedding is the person getting married,” says Arielle Link, author and illustrator of the breakthrough planners. Link continues, “There’s just so much information and inspiration out there that it becomes overwhelming. To top it off, many books inundate the bride and make her feel worse - not better, which causes some to spend even more money hiring planners or experts in an effort to make sense of it all.” The Perfect Little Planner streamlines the process by combining checklists, workbooks, and a 52 week diary-style countdown calendar - along with cost-saving ideas, inspiration, and resources in a way that’s almost tactical. 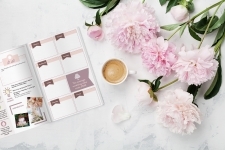 The Perfect Little Planner is available in three themes, Romantic for the classic bride, Rustic for the natural bride, and Edgy for the untraditional bride. Available at bookseller’s nationwide and online retailers including Amazon and BN.com. About Arielle Link: Manhattanite Arielle Link holds a B.A. in Graphic Design from The Rochester Institute of Technology, routinely ranked as one of the nation’s Top Ten Design Schools by U.S. News and World Report. Upon graduation, she moved to NYC and quickly became the go-to designer for high-impact, yet user friendly designs. Link has created and enhanced brand identity for a multitude of national and multi-national brands.